As a Youngstown property owner, it’s important to know the best re-roofing solution for roof drainage problems. Poor roof drainage will damage your flat roofing material and cost you huge expenses in the future. Because of the huge pressure of standing water pushing against your roofing material, it will create bruises. Eventually, it can tear a hole that causes leaks in your property underlayment. Indeed, it can become extremely expensive for Youngstown commercial properties with poor roofing drainage. A great re-roofing solution starts with identifying the cause. Oftentimes, a poor flat roof slope cannot deliver rainwater into roof drainage systems effectively. True enough, architects ensure flat roofs have enough slope to deliver rainwater to building rooftop ends and towards its downspouts. However, the poor roof construction can result into the water getting trapped along one area of the roof. In basic physics, a slope will deliver any water weight downward. However, flat roofs can have extremely low slopes. Therefore, poor construction may introduce uneven slopes that cause poor roof drainage. Standing water can place immense pressure on roofing materials, which can cause internal commercial roof leaks. Saddles help direct water towards the drains. True enough, even with the highest angle possible in low-slope commercial roofing, a huge amount of water will still pass over the drainage hole. Therefore, saddles serve as a rebound board that sends water straight into the drains. Unfortunately, contractors may have installed these saddles in bad angles. Therefore, a huge amount of standing water remains on your roof. If your roof is over 10 years old, it can cause tearing, bruising, and eventually lead to leaks. True enough, architects know all low-slope roofing must have a single direction. In fact, for multi-winged commercial properties, these slopes must form butterfly wing-type shapes to lead water in a single direction. Unfortunately, multiple roofing slopes may not always work as expected. In fact, some contractors might erroneously create a slope that sends running water towards another wing. As a result, water tends to overflow to the other low-sloped roof and creates dangerous standing water. The first re-roofing solution for roof drainage problems is to remove your old roof material. Then, you will inspect the slope of your roof for any signs of damage resulting from standing water or material or structural age. To remove commercial roofing membranes, you’ll need a hammer with a nail remover. Next, remove the nails with the nail remover. Then, using a pry-bar, you can tear off the old material seams. Lastly, do the same for the rest of the squares. The next step in the right re-roofing solution for roof drainage problems is to check the roof deck slope. 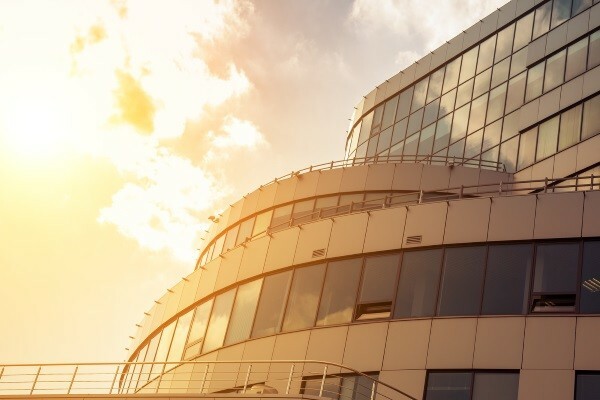 If your commercial property roof is over 10 years old, roof material weight and foot traffic can cause structural bending, which will require reconstruction. You will need to ask a reliable roofing company to help you reconstruct your roof deck. However, structural roof deck damage rarely happens. Therefore, your roofing contractor can check whether there are uneven roof slopes or poor slope angles that require some fixes using their expertise. 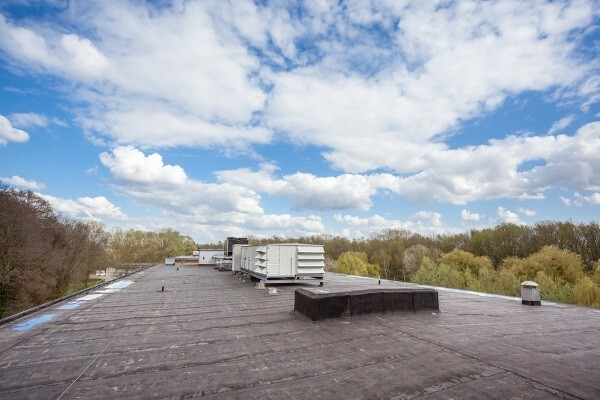 Upon successfully fixing your commercial roof slope, the next step in the proper re-roofing solution for roof drainage problems is to perform roof slope tests. You can do this by using a water hose to spray water all over your commercial roof. Then, check if the water heads towards the building rooftop ends and into your downspouts. This simple test allows you and your construction team to deliver the right fixes in the same day. To prevent any possible long-term roofing material slope structure damage, part of the best re-roofing solution for roof drainage problems is to provide consistent roof maintenance for your commercial property roof. True enough, roofing material manufacturers will claim their roofing material requires minimal maintenance. However, standing water is a structural issue. If left unattended, they can change the slope structural shape, which is the common symptom of poor flat roof drainage. Many commercial property owners love EPDM or rubber roofs because it is affordable and durable. It can last for 20-30 years. It is the most affordable single-ply membrane in the market costing about $0.4 per square foot. In addition, contractors can quickly install this roofing material with ease. Most rubber roofs are self-adhering. Therefore, contractors can just unroll the membrane and finish the task in less than a week. With less work, you pay the least amount for roofing tear off, structural repairs, and replacement. EPDM single-ply membranes are easy to install, replace, and are exceptionally affordable. Thermoplastic polyolefin (TPO) is the successor of EPDM roofs. With talc and fiberglass reinforcement, it has a completely white membrane. However, other manufacturers produce them in different colors, which cost higher than the basic material. TPO has excellent UV ray reflective capability. In addition, it provides excellent roofing insulation and 20-30 years of excellent roofing protection and longevity. However, it has a higher price than EPDM roofs at $5-$6 per square foot. Polyvinyl chloride (PVC) is the most expensive yet most durable of the three in-demand single-ply roofing materials. Manufacturers create them with the same base materials as their piping counterparts. However, PVC is reinforced with talc and fiberglass to improve its overall material composition. In addition, it has a formidable 300 pounds-per-inch (PPI) strength. This allows it to carry multiple heavy materials such as HVAC units, packages, and others. On the other hand, it is quite expensive at $10-$14 per square foot. PVC membranes are extremely strong and durable. It has enough strength to carry multiple HVAC units. True enough, not all roof drainage problems are the same. This is just one solution to a particular roofing problem. Therefore, you’ll need a professional roofing contractor to look in-depth at your possible drainage issues effectively. 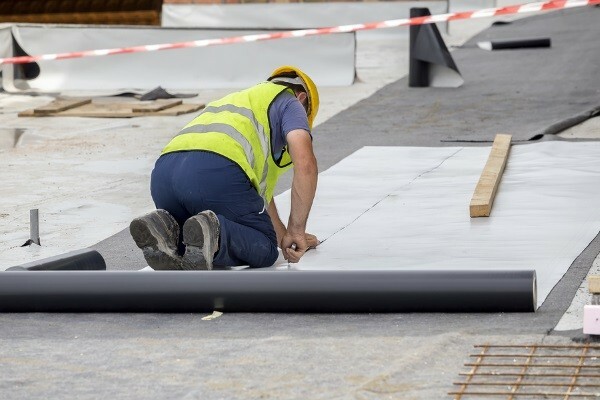 If you haven’t found a good commercial roofer to help you, you can count on us at J&M Roofing LLC to help you with any of your commercial roofing needs. We have decades of experience working with commercial property owners. Contact us today!